The National Union of Mineworkers in South Africa said Sunday it's looking for wage increases up to 60% more than current levels from gold and coal companies, Reuters reports. 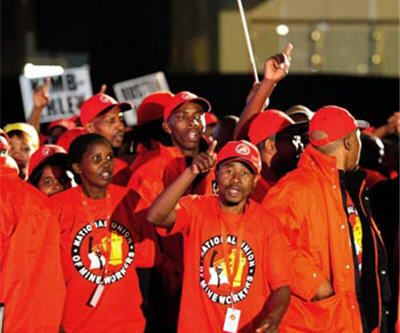 In a submission to the industry's Chamber of Mines, which negotiates for employers, NUM said it wants an entry-level wage of $750 (7,000 rand) per month minimum for surface workers and $850 (8,000 rand) for men underground. Currently, those on the surface earn $500 monthly (4,700 rand) and those underground earn $530 (5,000 rand). That's a 60% increase for workers in the shafts. For more experienced and skilled workers, as well as for other wage categories, NUM said it wanted a 15% increase. Impala Platinum said Friday the country's mining industry cannot afford wage increases and new strikes are likely in the coming weeks of negotiations, according to another report by Reuters. In 2012, South Africa mining firms lost billions in revenue due to job action and more than 50 people were killed during the strikes.